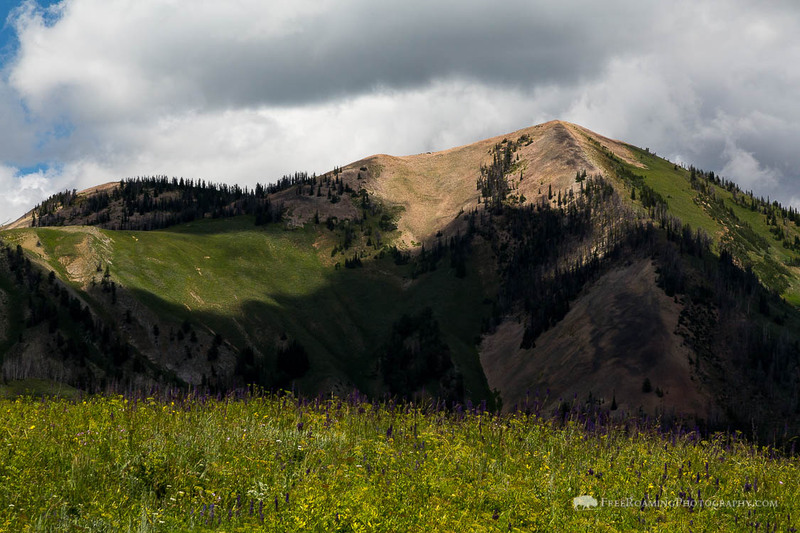 If the hike hadn’t been as challenging as it was, I might have felt a little demoralized by the name, but summitting Cream Puff Peak does not come easy for anyone, especially once the 6-7 foot wildflowers have grown in. This hike is definitely not for novices or anyone looking for a casual day in the mountains. After my safe return, I discovered there were two main routes up the peak. I was using a popular guide book by Rebecca Woods called Hiking the Tetons (a mandatory addition for anyone wanting to hike in the area). The trailhead I was directed to was on Bull Creek Road, just west of The Shield (a popular climbing destination) and Granite Hot Springs. As I began hiking, I was thankful I was in long pants. 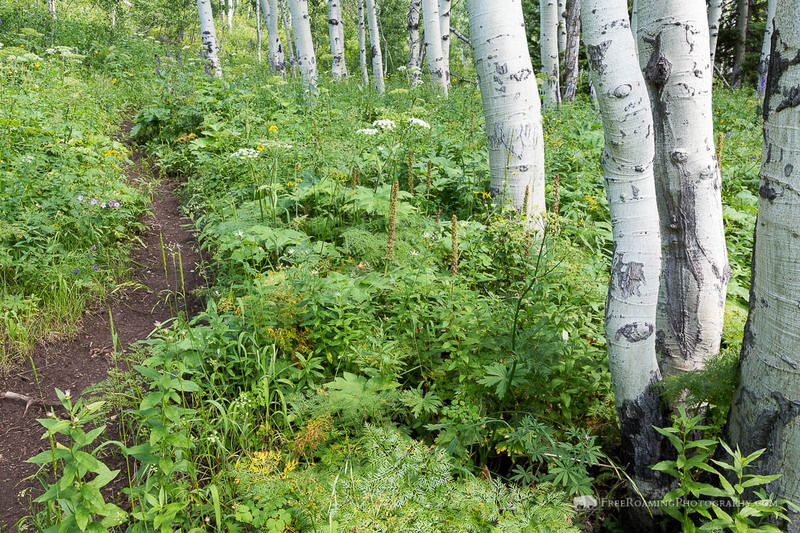 This trail is seldom used so the vegetation along the trail was dense at best, and at least a few feet high. It had also rained the previous day, which meant a lot of the plants were still very wet, soaking my legs as I brushed past them all. It didn’t take long for the trail to begin gaining significant elevation, at which point I noticed four turkey vultures circling overhead. It was a breezy morning, so assuming they were just enjoying the breeze, I admired them and then moved on. I popped in and out of not-so-dense forests of fir and spruce and even the occasional aspen grove, the latter becoming more frequent as the elevation increased. With the increase in elevation came more and more wildflowers. Duncecap larkspur, mules ear, lupine, and Indian paintbrush carpeted endless meadows on the mountainsides. Views to the south opened up as well with the higher elevations. It was also at this point that I began to notice those same four vultures circling overhead again. I thought it a little peculiar, but then I was distracted by the view of the northern Wyoming Range and continued my climb through the sporadic evergreen and aspen trees. The trail continued upward, seeming to approach a distant ridge up above as I popped out into another larger meadow about 1.5-2 miles into the trail. 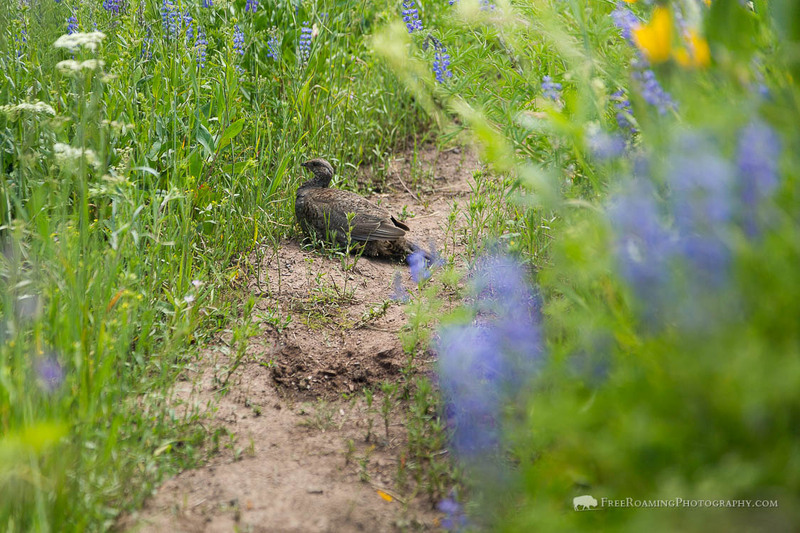 As I hiked through the meadow, I noticed a shadow on the ground flying past in the shape of a large bird. I looked up, and again, those same four vultures were circling, now making an occasional pass only about 30 above me. At this point a person’s imagination starts to kick in. Was there a reason I was the only one on the trail and being stalked by vultures? Is there something up ahead that I’d rather not know about? There was only one way to find out. Of course had I been more influenced by bad Hollywood movies, I might have started to wonder if the vultures were well underway in a mental attack on me. Maybe they had learned that with enough persistence, they can cause a human to panic and run and just have that person injure themselves, doing the work for them. Fortunately, I know nature doesn’t reflect idiotic Hollywood movies like The Grey. As I continued on, I told them I was healthy and wasn’t going down, and I never saw them again. The views to the south only got more and more impressive as the trail ascended through the wildflower meadows, and it didn’t take much longer for views to the east to begin to unfold too. Pinnacle Peak popped out over the eastern ridge with other neighboring peaks, and shortly thereafter, the trail crested a significant ridge where sweeping views to the north were finally revealed. 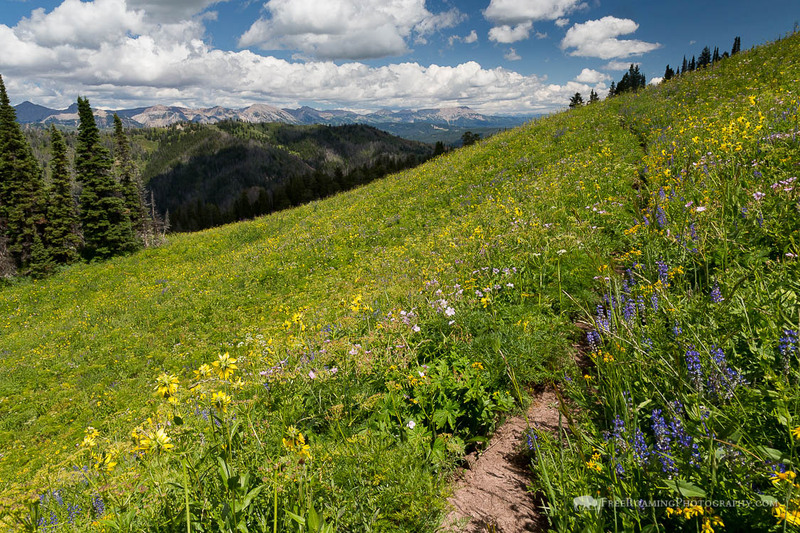 Some of the Gros Ventre Mountains’ finest peaks were showing off in a mesmerizing 360 degree panoramic view. The trail then cut west heading down toward a small evergreen forest, supposedly with a hunting camp on the south side which I wasn’t able to find, or even see. The trail began to descend into the woods, and became somewhat difficult to follow at times. 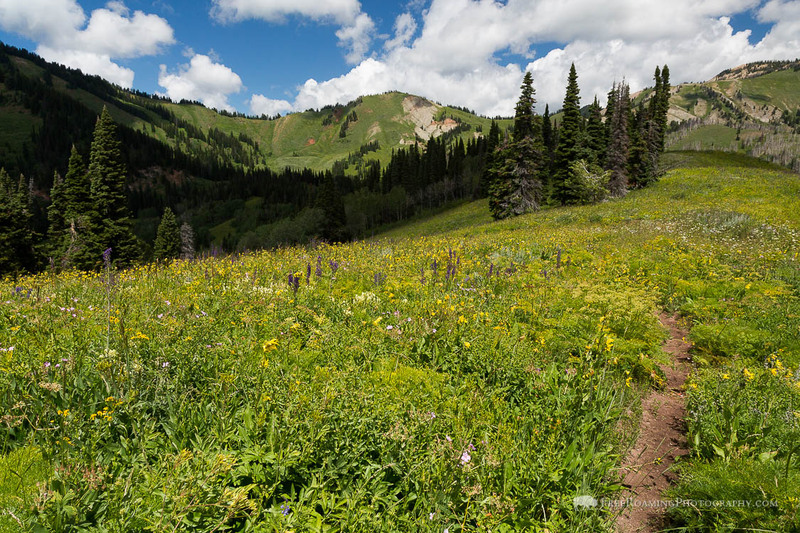 I lost the trail more than once and even became confused by now obsolete forks, until it finally emerged from the forest into a large, open meadow covered in wildflowers that were easily a minimum of five feet high. I followed the trail, thinking my hike was nearing its end with one last climb up the distant ridge, when all of a sudden the trail was gone. It had completely vanished into the overgrown meadow and there was no sign of it. I headed back to the treeline and noticed a fork I hadn’t seen before. I took the new trail, but suffered the same fate. Fortunately, this one of the rare exceptions where I actually brought the guide book with me. I took it out, read about where I was, but still couldn’t make any sense of where I was supposed to go. I had apparently missed my opportunity farther back on the trail to scope out the ridges and meadows to see more accurately where I was supposed to be going. In fact I wasn’t even sure at this point which peak was Cream Puff Peak. There was a distant ridge, and I knew I needed to get on top of it. I picked the latter fork and headed back into it, determined to get somewhere. My pace slowed to a crawl as the thick plants, all competing to be the tallest, seemed to be grabbing at my legs to hold me back. After only a few dozen yards, I came to a small stream, producing just enough water to refill, had I needed it, but at about 10-15 feet down a small ravine, had produced some steep inclines that made getting down and across a rather tricky task. I worked my way down the bank, slipping a couple of times until I had reached the stream, but I didn’t have time to plan my jump across. I felt my balance give out and so I just made a leap of faith, hoping I wouldn’t land into a stream I couldn’t see. I hit solid ground, got my bearings, and made my way up the steep incline as best as I could. After bushwhacking for what seemed like miles, I was a couple of hundred yards from the tree line where I lost the trail. Fortunately, I found a game trail (or possibly a rarely-used hiking trail) which made things slightly easier, though the plants still seemed hesitant to see me proceed. I forced my way through the game trail until I realized it was turning toward the opposite direction that I wanted to be going. I could either head off the makeshift trail with no real certainty where I should be heading, or continue up to the next ridge to at least get a better view and get my bearings. The path of least resistance, so to speak, in this case was the latter. I reached the ridge and found a very impressive view of a large peak just to the north. I knew it wasn’t Cream Puff Peak, but I was wondering why I wasn’t making my way there in the first place. It was certainly the most impressive looking in my reachable vicinity. I checked the time, and realized I wouldn’t have the time to summit either peak. I needed to be back in the evening and I had already been going for over three hours and 2pm was quickly approaching. I also knew it wouldn’t be easy getting back to the actual trail. 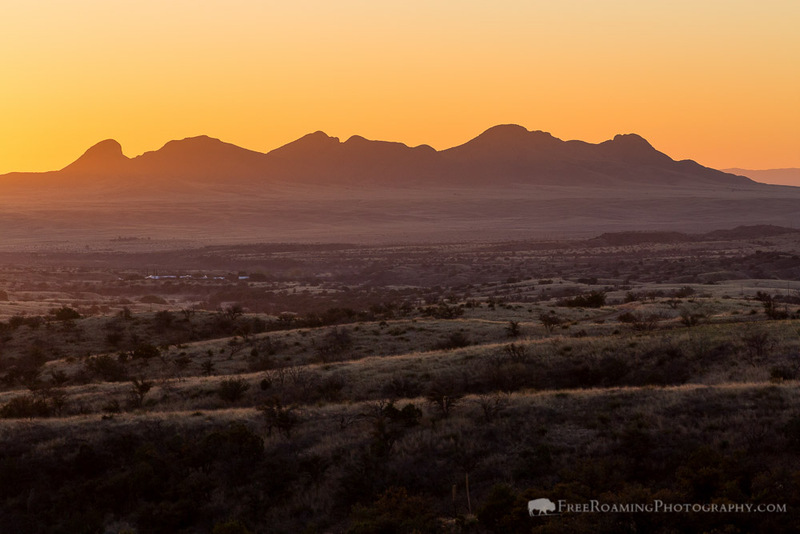 I glanced back up at (to my knowledge) the unnamed peak, and regretfully turned around to be sure I’d be back in town when needed. As a not-so-smart compromise, I decided to hike to the other side of the meadow. With uneven terrain, thicker brush, and even more stream crossings, this proved to be one of my poorer decisions. I fell multiple times, tore up my pants, and am pretty sure I got stung by something on my leg. Though it was only 200-300 hundred extra yards or so, it probably ate up at least an extra 30-45 minutes going back the "scenic" way. Having finally reached the trail again (I was at least smart enough to consistently look back to make sure I’d find it), I was beginning to get very hungry. I had a quick snack, and proceeded back up the trail to the initial ridge that opened up all the views for me. Here I had a (relatively) proper meal, while also getting a much better lay of the land. Now determining where both Cream Puff Peak and the hunting camp were, I had a much better understanding of where I was actually supposed to go, and just how far off the trail I had actually gone. Cream Puff Peak was apparently much farther south than I thought, and the ridge I was going to was too far north. All I could do at this point was to save that valuable information for next time, and enjoy my lunch and the tremendous views that were in front of me before heading back down. After over six hours on the trail, I saw a whopping total of zero other people. In fact I didn’t see a single other mammal either. There were plenty of signs of deer, elk, and moose, but nothing else, unfortunately. In addition to my stalking vulture friends, there were a few hawks out, and plenty of sage grouse to practically scare me off the trail as they began to fly. You don’t know how startling it is until you’ve experienced it. So, if you’re looking for some solitude and a good challenge, this one’s definitely worth a shot. From Jackson, take Highway 191/189 south to Hoback Junction. Follow the highway east and into the Hoback Canyon. Continue along the highway for roughly 11 miles and there will be an obscure, unsigned dirt road on the left. If you pass The Shield or the road to Granite Hot Springs, you just missed it. There will be a parking area just up the road, still visible from the highway. Walk up the road a bit more, and a sign marking the trailhead will be visible off the road to the left.